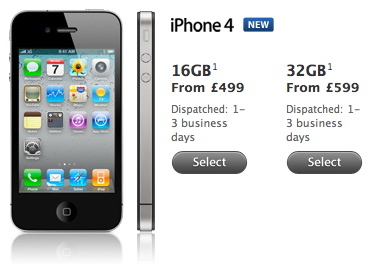 Unlocked iPhone 4 units sold by the Apple Online UK Store are now shipped within 1-3 days, a third reduction from 1 week. This is a good time to buy an iPhone 4 and ship it to Saudi Arabia using Aramex as these iPhone 4 models have FaceTime enabled (unlike Mobily). The model numbers of these units are: MC605B and MC603B. Importing an iPhone 4 is also a good alternative to local scalpers who raised the iPhone 4 prices again, touting FaceTime as an advantage. Hi. I have just received my factory unlocked iphone 4 from UK. I have cut my STC sim and inserted it. It recognizes the sim but the phone says no service. Can anybody help me to activate my iphone 4 from UK? I’ve been looking for a 16gb iphone since dec. 20 and so far, none of the mobily stores (in Al-Batha) i’ve been to are selling the iphone 4. The mobily rep just told me that they run out of stock, Where you able to buy one already? I would appreciate if you can tell me where can I buy one. All of the mobile shop/stores in electron (Al-Batha) are taking advantage of this situation by selling the iPhone 4 at very high prices (16gb for around 3300 SAR).